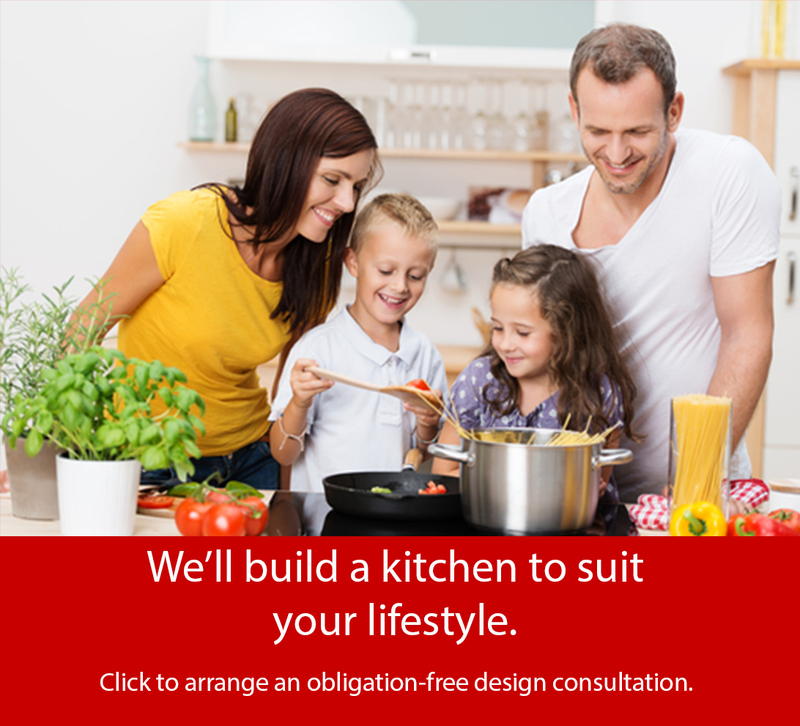 Get a feel for our range of kitchen doors, colours and materials for country and modern kitchen ideas. 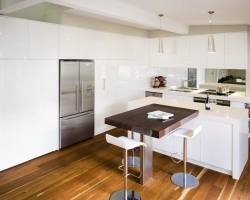 Learn more about kitchen benchtops and their durability. 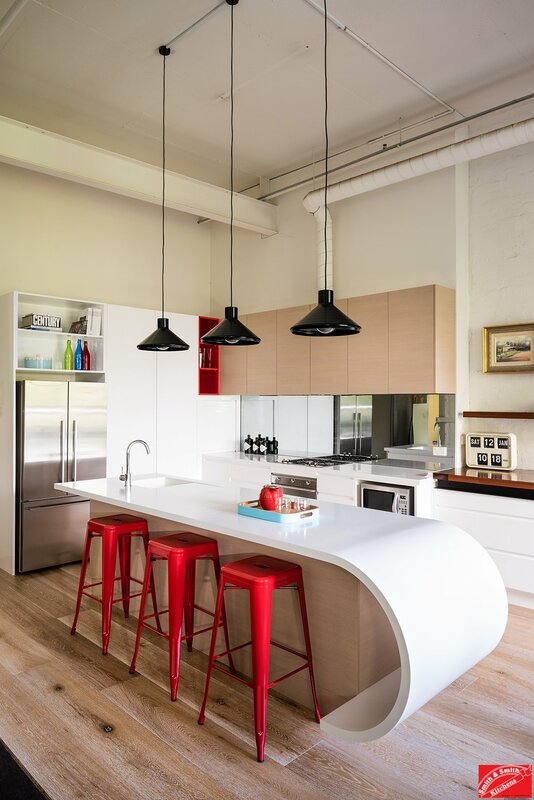 Choose the benchtop that best suits your preferred kitchen design. 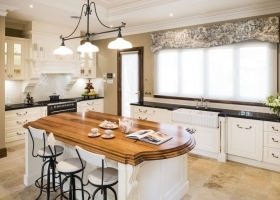 Kitchen benchtops are subject to the most rigorous work in a kitchen. Aside from the floors, the bench takes the greatest beating of the surfaces present. 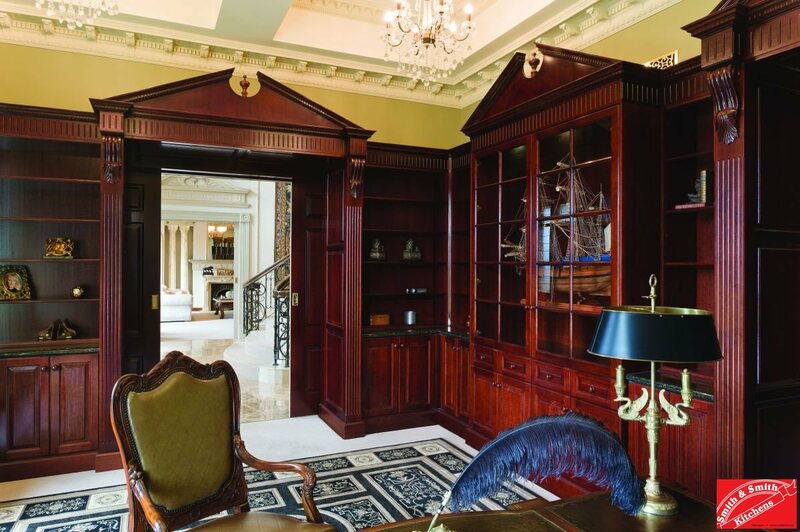 There is no material that is completely impervious to scratches and dents, heat and chipping. Some care must be taken with all materials, it is merely a matter of the type of attention you are willing to devote to maintenance. 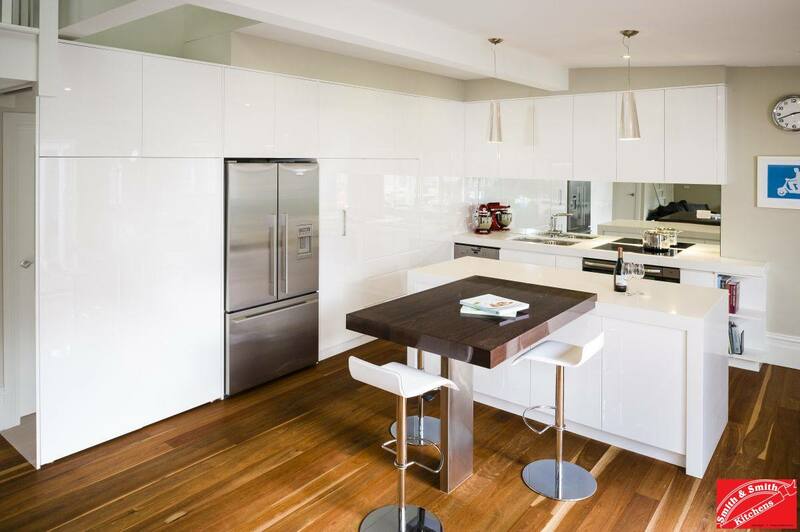 Laminate Benchtops are very common because of their durability, availability, price, colour and finish options. 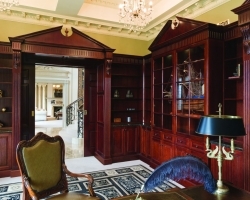 Smith & Smith deal with all the major laminate suppliers. The only difficulty in using laminate is in choosing a colour from their vast ranges! 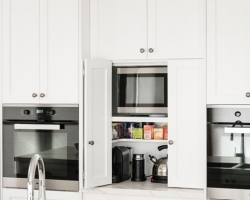 Never place hot pans or chop directly on a laminate surface. Trivets should be used under hot pans and chopping boards should always be used when knives are out. 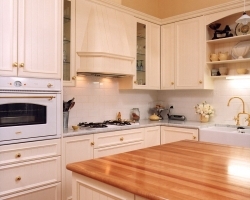 Laminate will scratch and chip if handled roughly, however with normal kitchen usage it wears very well and should look great for years. 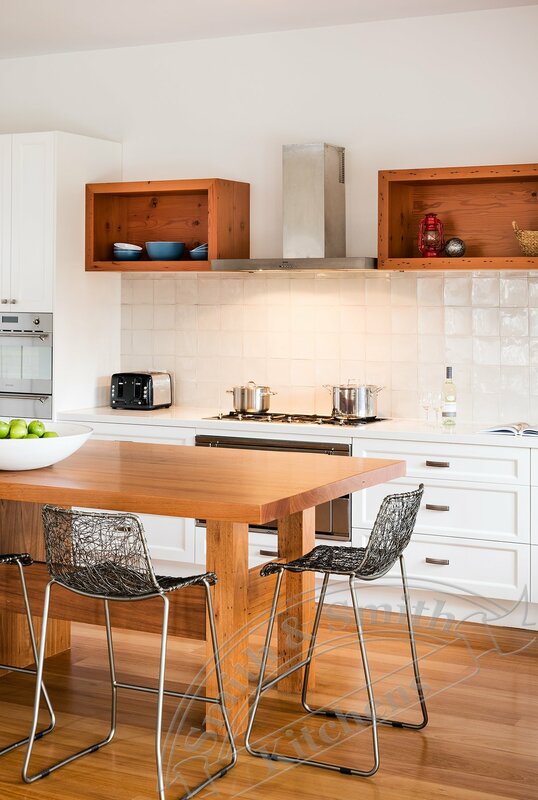 Modern, square edged breakfast bar benchtop. 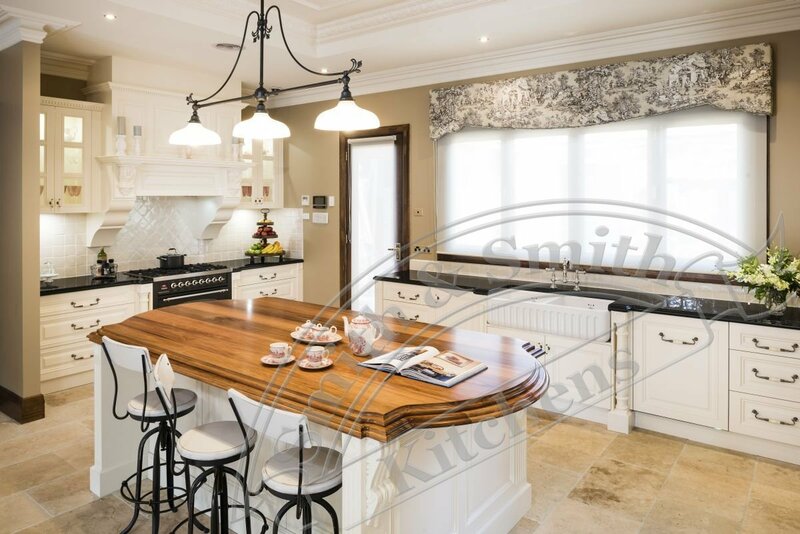 Double bullnose country style timber benchtop. 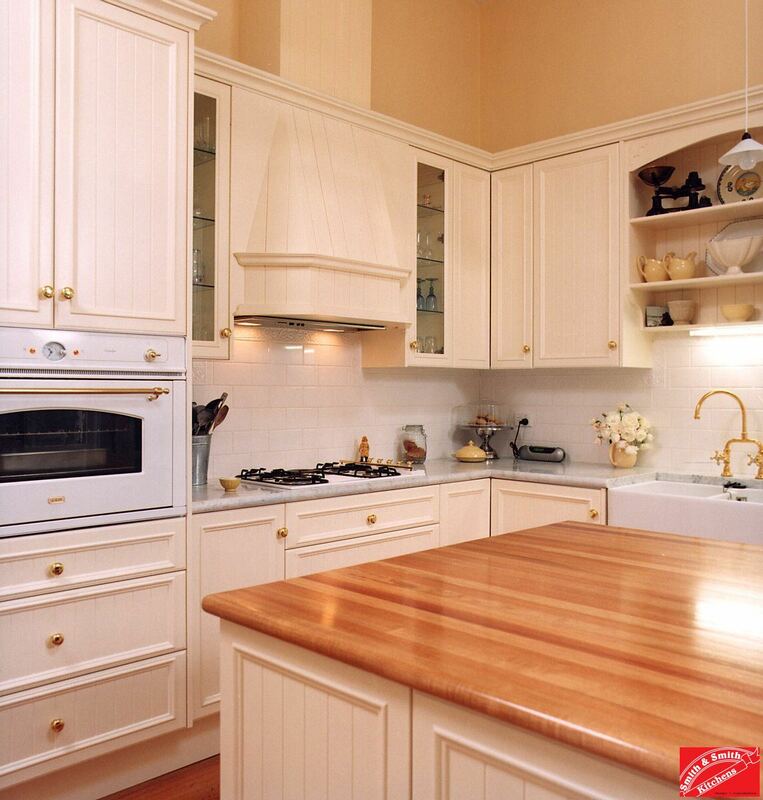 Smith & Smith handcraft all timber benchtops fitted to their kitchens. 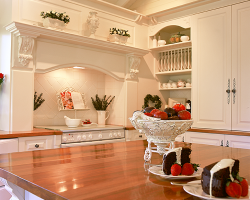 Solid timber benchtops give a unique finish to match a variety of styles, from the traditional to ultra-modern. 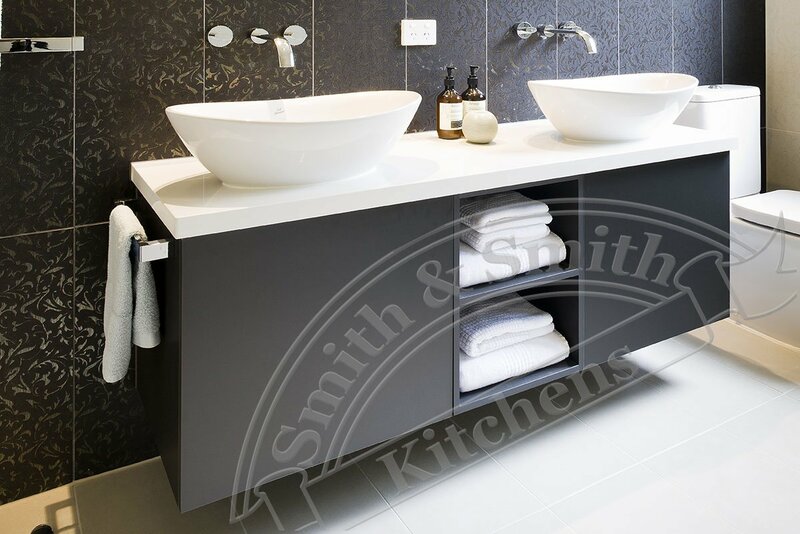 Smith & Smith benchtops are usually coated in two pack polyurethane or a wood oil to give them protection. 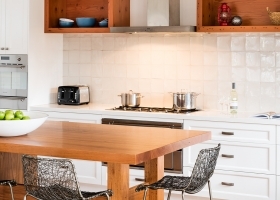 Hot pans should always be placed on a trivet and a chopping board should be used during food preparation. 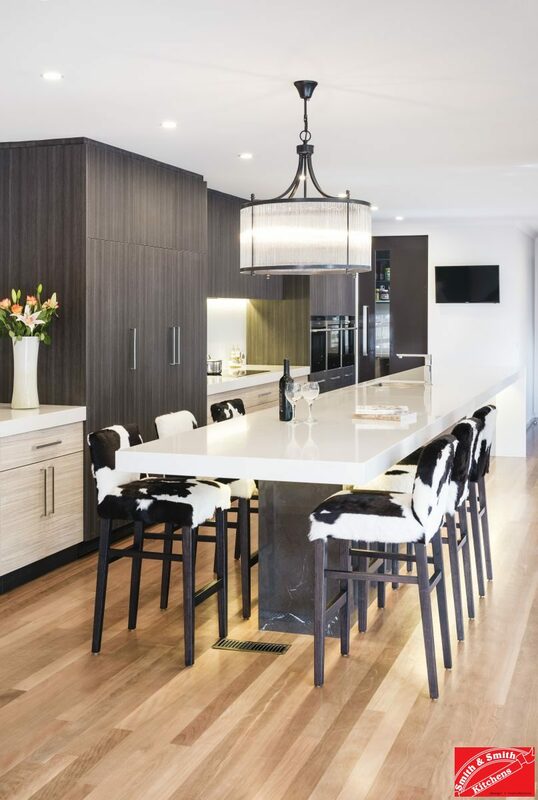 Prolonged hours of direct sunlight may alter the colour of a timber benchtop, discuss benchtop placement with your designer. Natural stone is beautiful, heatproof and resistant to scratches and nicks. Because natural stone is not formed by a machine, there are natural variations in colour and patterning – these variations are to be celebrated. 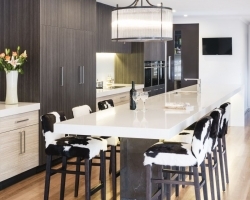 If a uniform look is desired, engineered stone provides greater uniformity of colour, pattern and texture. 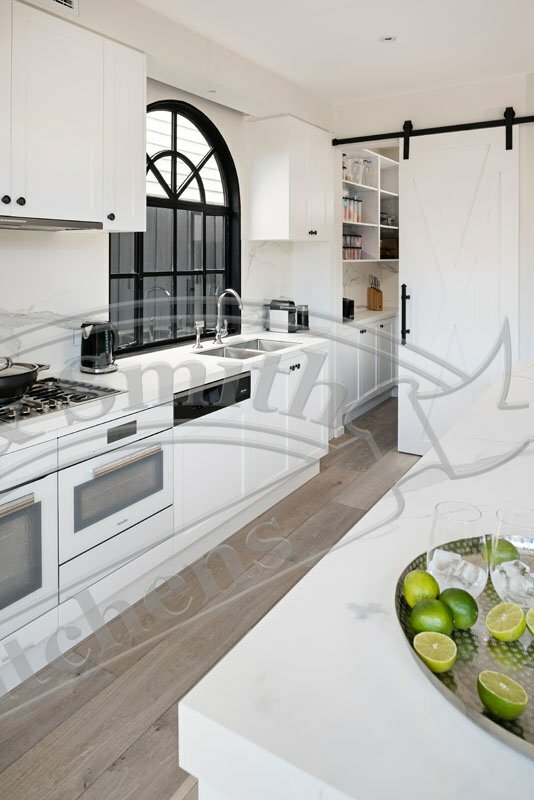 All natural stone is porous and therefore subject to staining from oils and other ingredients. 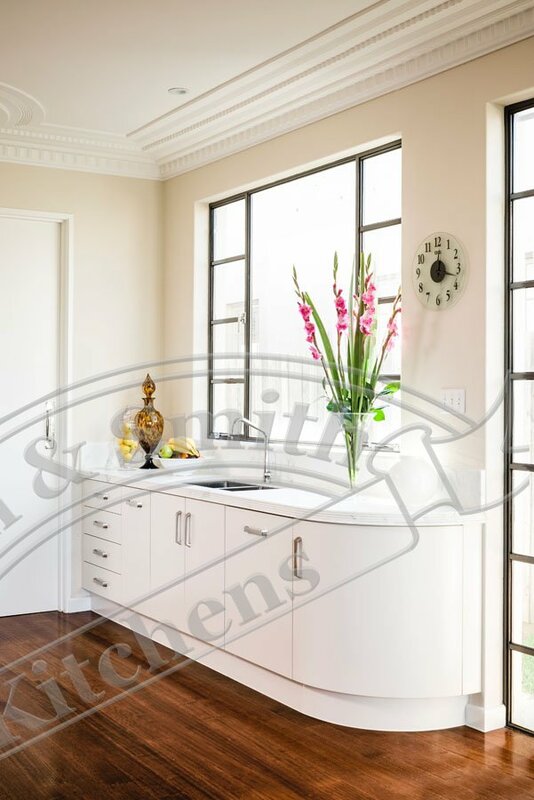 If care is taken to place clingfilm over the bench (wiping the benchtop with a damp cloth before applying the clingfilm ensures it stays in position) before rolling out pastry and ensure cooking splashes and spills are wiped up swiftly, your natural stone benchtop will look beautiful for years. 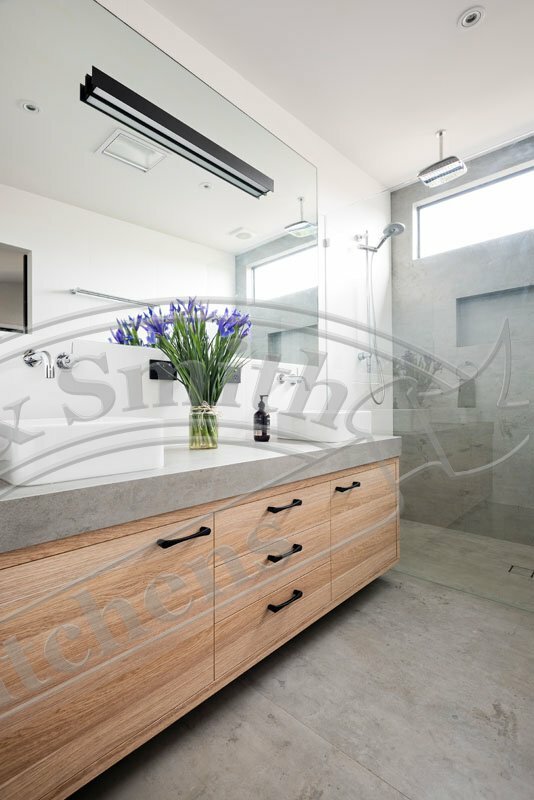 A natural stone that provides a unique look. Only slightly less porous than Marble. Extremely hygienic and often found in commercial kitchens it is very easy to keep clean and capable of withstanding very high temperatures. If you’ve had a stainless steel kitchen sink and draining board, you know how handy it can be to quickly plant a hot oven tray on it when your hand is starting to burn! 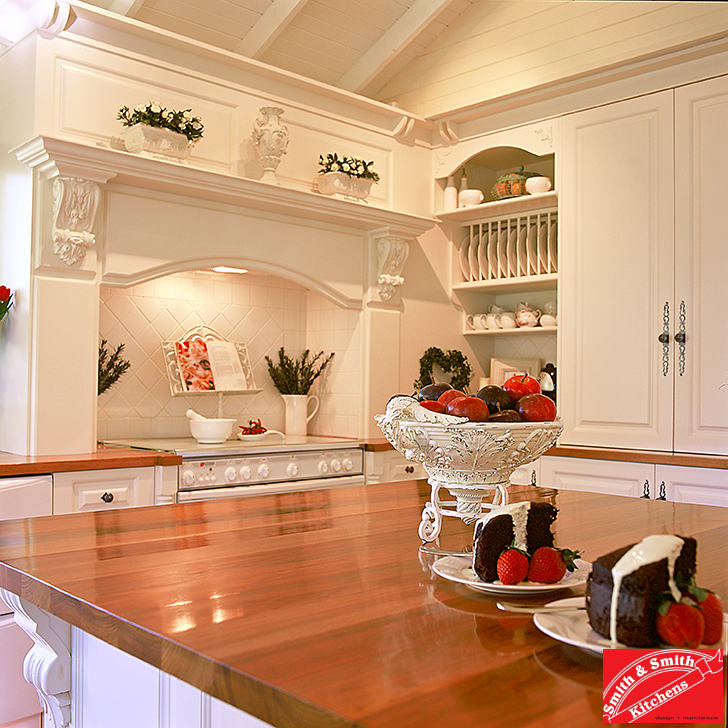 The largest drawback of this type of benchtop is that it tends to scratch and dent relatively easily. Over time it will develop a patina that hides large scratches and dents. 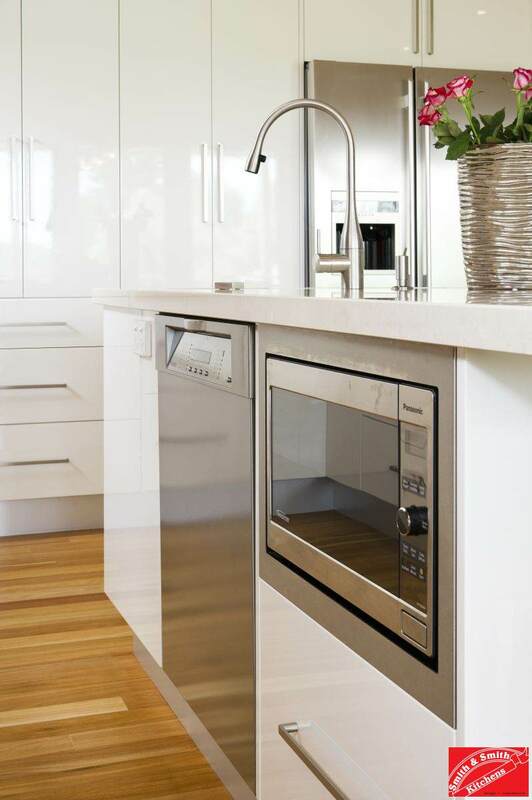 If you go for stainless steel, it is important to be aware that it is not going to have a pristine brushed look forever. 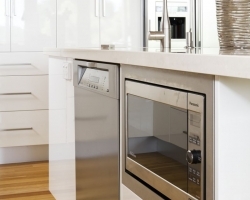 A stone composite benchtop is made up of approximately 95% stone powder/crushed stone and 5% binding agent. It’s extremely durable and able to withstand extremely high temperatures and is much less porous than natural stone. 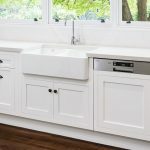 Corian benchtop with integrated sink and large curved side. 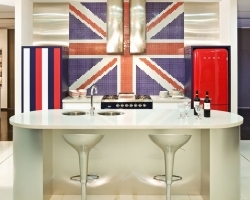 Corian is made of natural minerals combined with an acrylic binding agent. 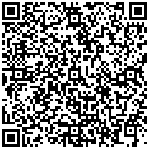 It is highly durable and can be formed in artistic ways. It is non-porous, therefore somewhat resistant to staining. 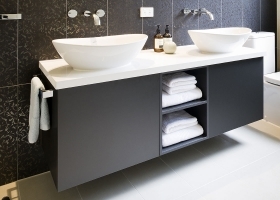 Sinks can be integrated into Corian benchtops, leaving no groove for mould to form in. 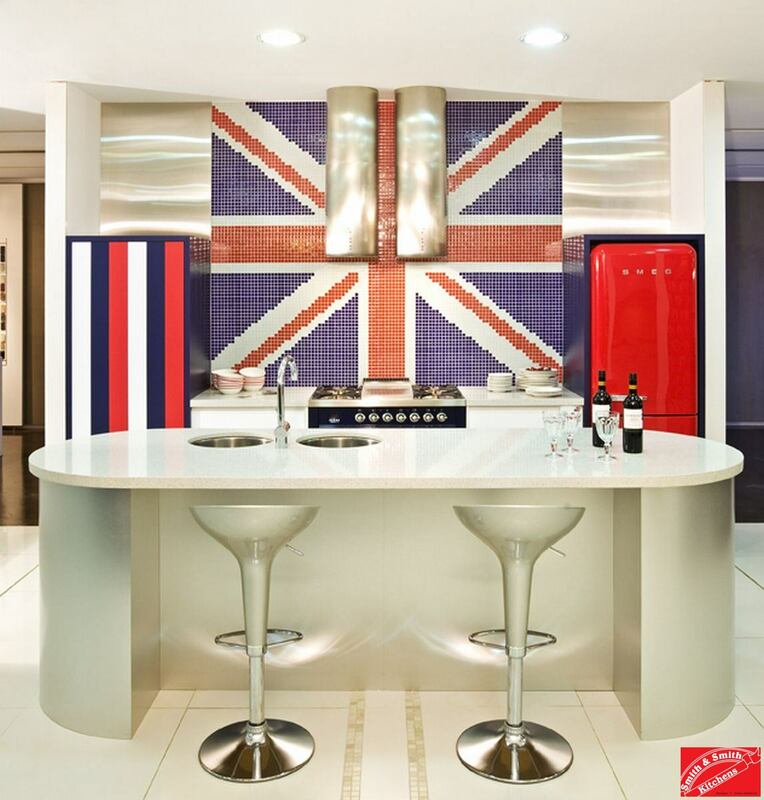 Corian can also be curved up walls or rolled down benchtops for interesting effects. 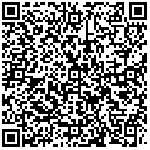 See the Corian website for more information. 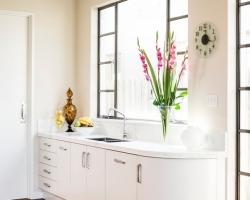 Caesarstone is made of a combination of natural stone and binding agent. 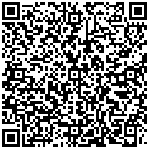 It is highly resistant to staining, and scratches. A great range of colour options are available. 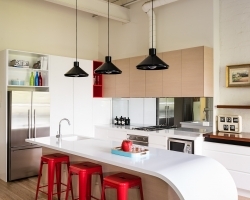 See the CaesarStone website for more information. 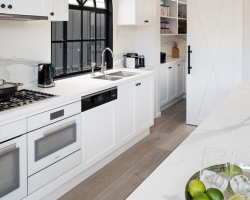 Large format porcelain is new on the benchtop scene, but surprisingly so given it’s as old as the hills in smaller tile format. Large format porcelain has great looks and impressive durability. 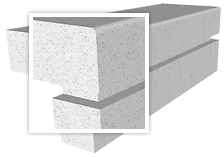 In addition to benches, it can also be used on floors and walls – as with porcelain tiles. There are a great number of textures, colours and patterns to choose from including rusted metal, timber and of course stone. 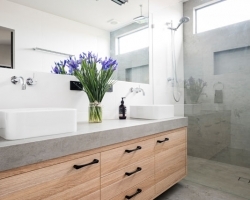 Porcelain does not scratch easily and it is heat resistant. 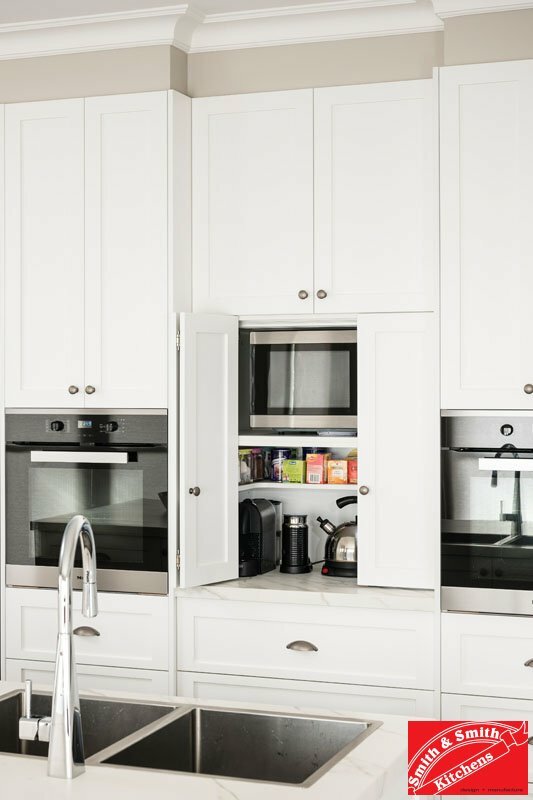 While we always recommend the use of chopping boards, you can go ahead and put your hot pans directly on this surface without a worry. The other major drawcard of porcelain is that it is remarkably thin. The only thing porcelain cannot do is print it’s pattern throughout the sheet. 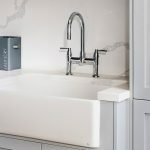 If draining runnels are required, they will reveal the inner solid colour of the porcelain.